THE ONLY ONES formed in 1976 at the dawn of the punk era although while incorporating elements of that style they also brought studied musicianship with guitarist John Perry citing Jeff Beck and Hendrix as major influences. Singer, songwriter and rhythm guitarist Peter Perrett, on the other hand, was steeped in the melancholic acid musings of Syd Barrett and his vocal phrasings often echoed the drawl of punk godfather Lou Reed. The band line-up was completed by Alan Mair on bass and ex-Spooky Tooth member Mike Kellie on drums. The band's debut album for CBS included the critically-acclaimed single 'Another Girl, Another Planet'. Whilst it might be claimed that The Only Ones never realised their full potential, they were somewhat dogged by record label pressures, internecine wrangling and, inevitably, Peter Perrett's drug dependency. The band split after working out their CBS contract in 1981. LEW LEWIS was a member of an early line-up of Eddie & The Hot Rods. 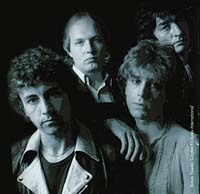 The Rods became one of the lynchpins of the burgeoning pub-rock movement in the late-seventies. Often seen as a response to the excesses of seventies prog-rock and stadium extravaganza, the pub-rock boom was fuelled by energetic bands whose economic delivery reflected their live surroundings. 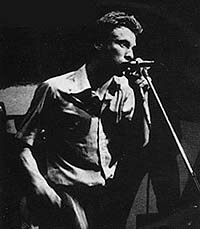 By the end of 1975, Lew Lewis and the Rods were regulars on the pub-rock circuit together with the Feelgoods and Kursaal Flyers. In March 1976 Lewis was sacked from the band, and set about forming the first line-up of the Lew Lewis Band, recording two singles ('Out For A Lark' and 'Boogie On the Street/Caravan Man'). Lewis achieved cult status on the R&B circuit and was also in demand as a session player, lending his harp-playing to albums by The Stranglers and the Clash. His second band, Lew Lewis Reformer recorded 'Save The Wail', released on Stiff Records in 1979. One final single for the label was released in 1980. A somewhat erratic figure, who in his heyday lobbed full beer glasses at his fellow band members, he was jailed for seven years in 1987 for holding up a Post Office with an imitation pistol. MALCOLM MORLEY's group Help Yourself folded in late summer of 1973 after releasing four acclaimed albums and he went on to play keyboard with pub rockers Bees Make Honey. During his stint with them he was asked to join legendary Welsh rockers Man and he contributed to their album Rhinos, Winos and Lunatics. After an appearance at the Buxton Festival in 1974, Morley quit the band and there followed a hiatus, in spite of offers he kept fairly low-key playing a gig with a group called the Plummets at the Hope & Anchor pub in Islington. He was encouraged by the wife of the owner of the remote Foel Studios in south Wales to take some of his compositions and record them. It was here he met Ian Gomm, guitarist and songwriter with Brinsley Schwarz who had left that band in 1975 and who was helping set up the studio. Morley recorded several songs in 1976 and an album release was mooted. However, like many rock artists during this period this was somewhat thwarted by the onset of punk. After some session work, he left the business in 1981. The master tapes to the 1976 sessions were considered lost until they were recently discovered by Ian Gomm. In 2001 there was the release of Malcolm Morley's debut album, 'Aliens' whilst more recently he has been working with members of the original Help Yourself line-up with a view to an album and live gigs. IAN GOMM is probably best-known for the time he spent in premier pub rock band Brinsley Schwarz. Together with fellow band members Nick Lowe, Billy Rankin, Bob Andrews and Brinsley Schwarz himself he contributed to a series of excellent albums. After that band's split in 1975 Ian retreated to the Welsh countryside and helped build and run Foel Studios. This also gave him a wonderful opportunity to try out his new songs with months of free studio time. While his former colleagues found fame and fortune elsewhere (Nick Lowe becoming a solo artist and sought-after producer and Bob Andrews joining Graham Parker in the Rumour) Ian Gomm busied himself on his first solo album - 'Summer Holiday' which - for the US market was renamed 'Gomm With The Wind' and spawned a hit single in 'Hold On'. The hastily-convened Ian Gomm Band then toured the States as support to Dire Straits and the live concert recorded in San Francisco in October 1979 picks up on the band's U.S. legacy, and includes Top 40 hit 'Hold On'. Subsequently, Ian carried on writing and recording,releasing a string of solo albums including 'Rock n Roll Heart', taped in Wales and Nashville, the latter sessions included members of the Amazing Rhythm Aces and Nanci Griffith.